Although it’s mostly what you’d presume from this site, I’m not completely obsessed with points and travel. 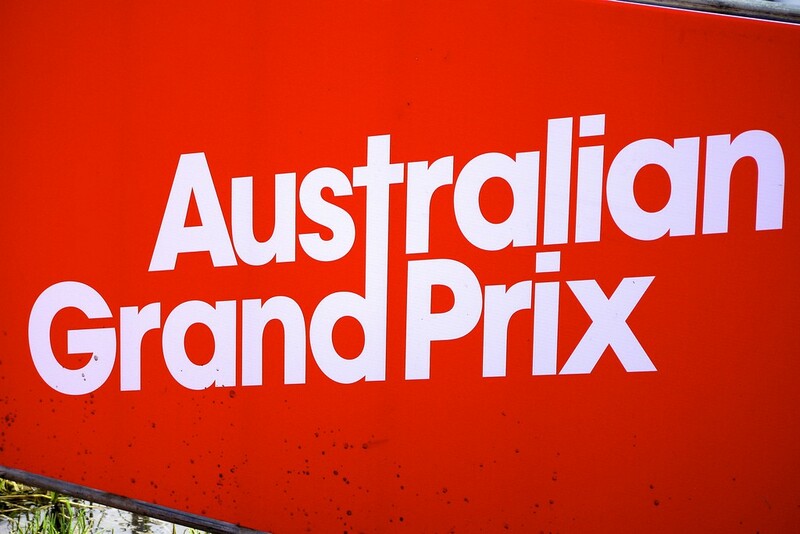 One of my other ‘things’ is motorsport and a general interest in cars, and I promised myself that this year I’d try and get to the Australian Grand Prix in Melbourne. With a friend coming along for the ride, it was time to set the plan in motion. I used a buy one, get one free return flight from the Virgin Flyer Visa acquired earlier in the year, and Virgin were offering the cheapest price anyway for that weekend. A 50% discount on the two tickets was a steal. 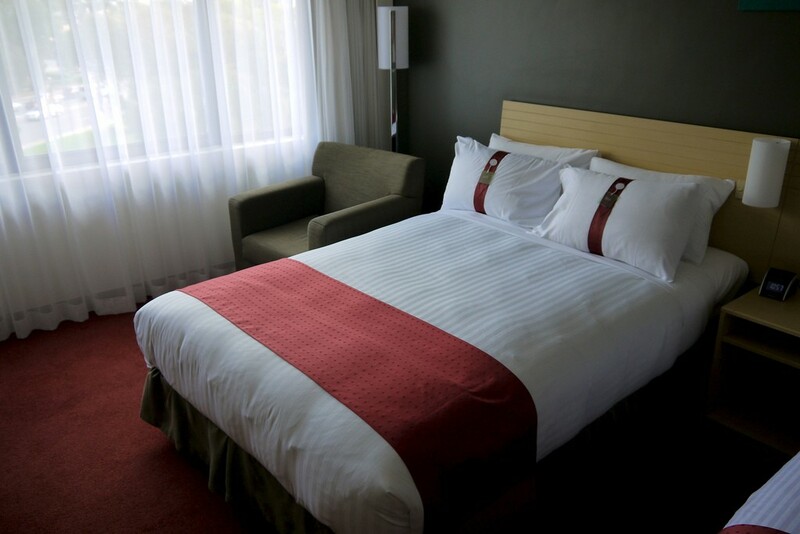 Accommodation was in the form of the not-so-glamourous Holiday Inn at Melbourne Airport. Rates for Melbourne Hotels for the GP weekend were predictably high, so instead of spending $225 I used 25,000 Priority Club points (with a rough face value of $100-$150). 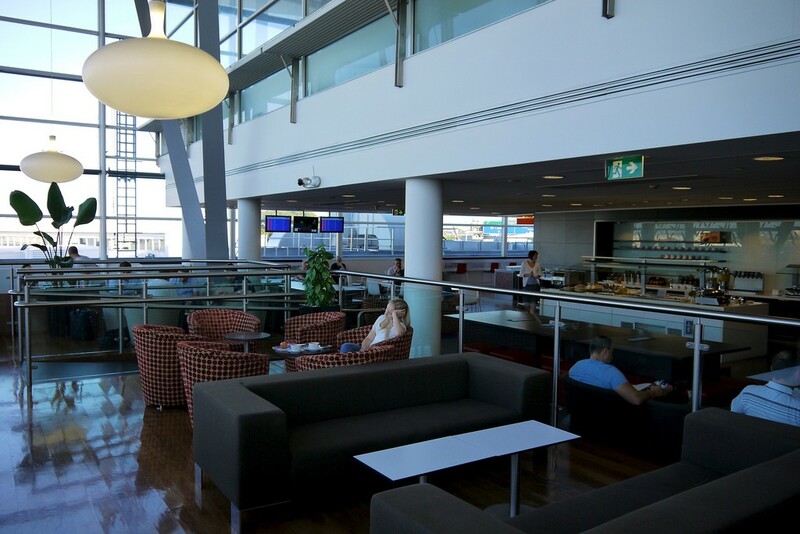 Leaving from Sydney and returning from Melbourne would give us the chance to check out ‘The Lounge’ in both Sydney and Melbourne. 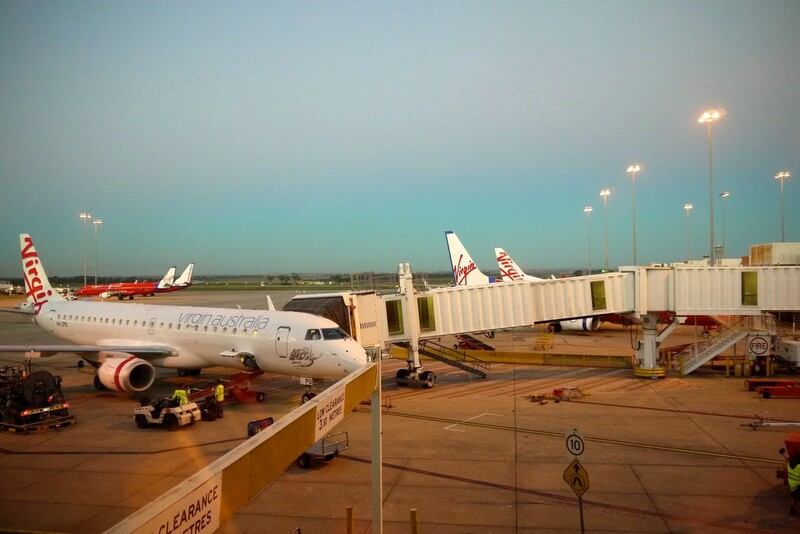 I’d previously passed through the Sydney lounge (review here) but Melbourne would be new. 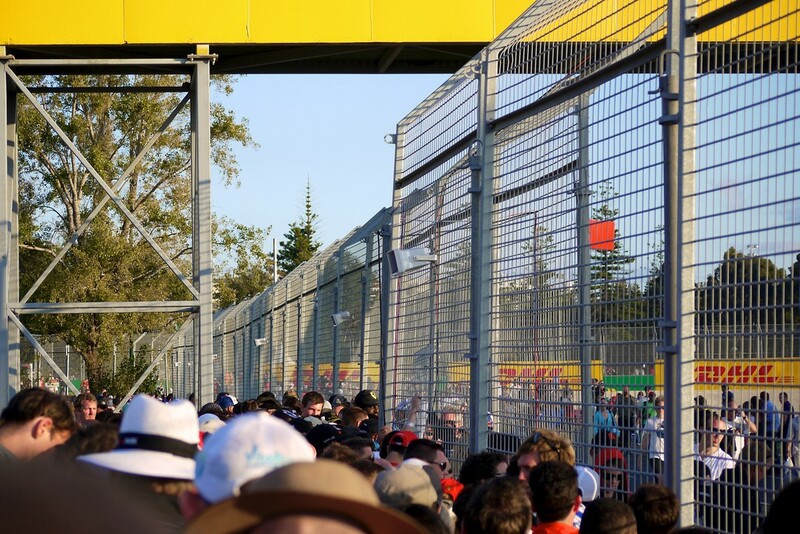 None of the flights, the hotel stay and lounges warrant a full review, so consider this a pictorial run down of the travel and the day at the Grand Prix. 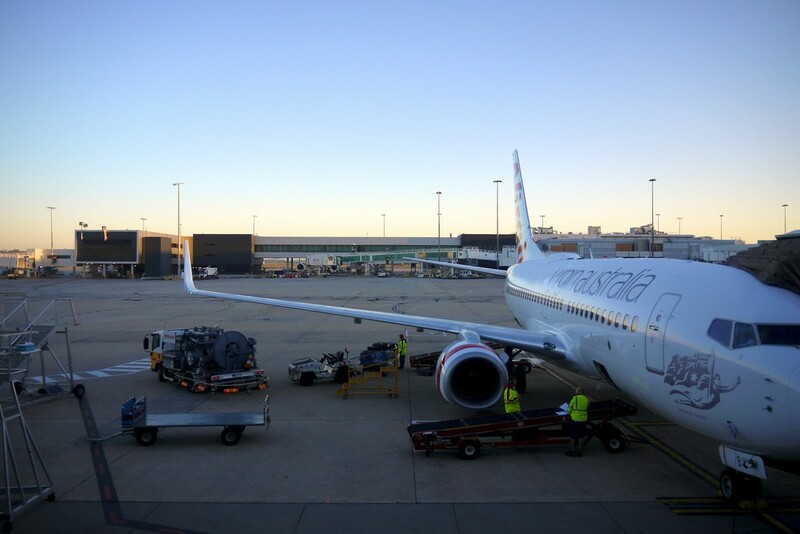 After checking in and clearing security at Sydney, we headed through to The Lounge for breakfast and a look at the view. 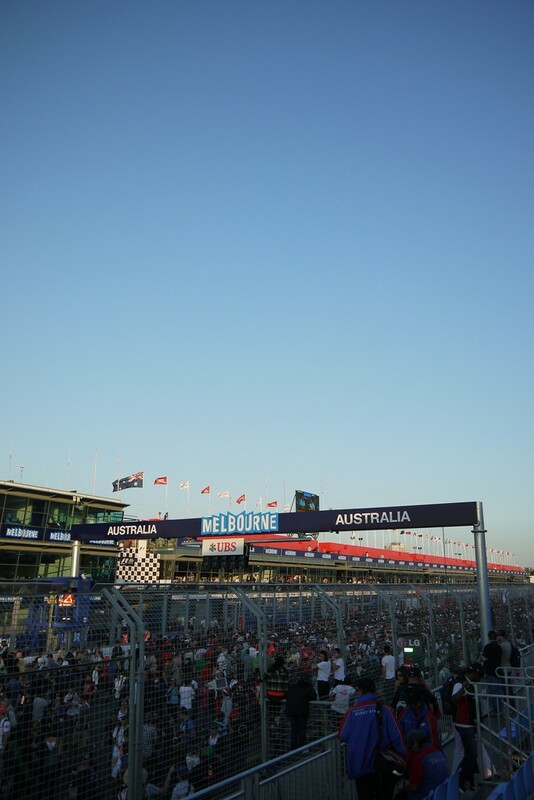 And we then headed off to Melbourne to join thousands of others at Albert Park. It was a warm, beautiful day, perfect for the event. 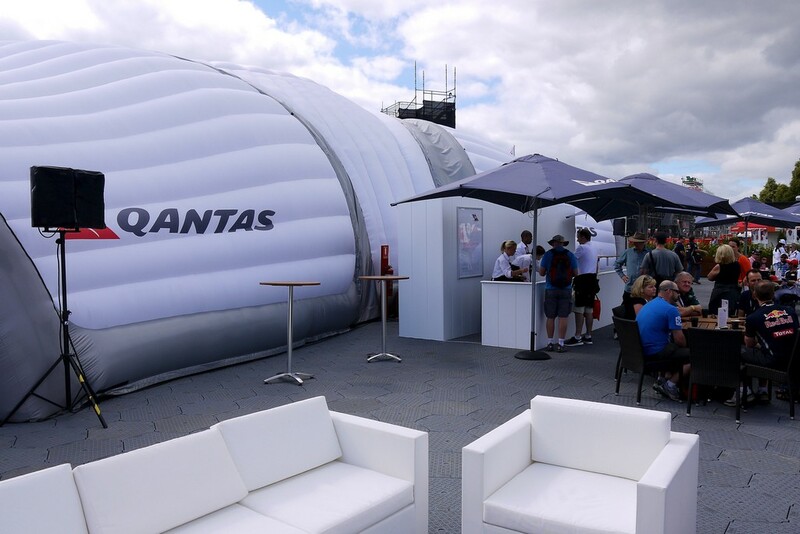 We had a look at ‘The Qantas Hub’ on the way in, a tie-in for Qantas’ sponsorship of the Grand Prix and an attempt at rewarding/promoting Frequent Flyer membership. 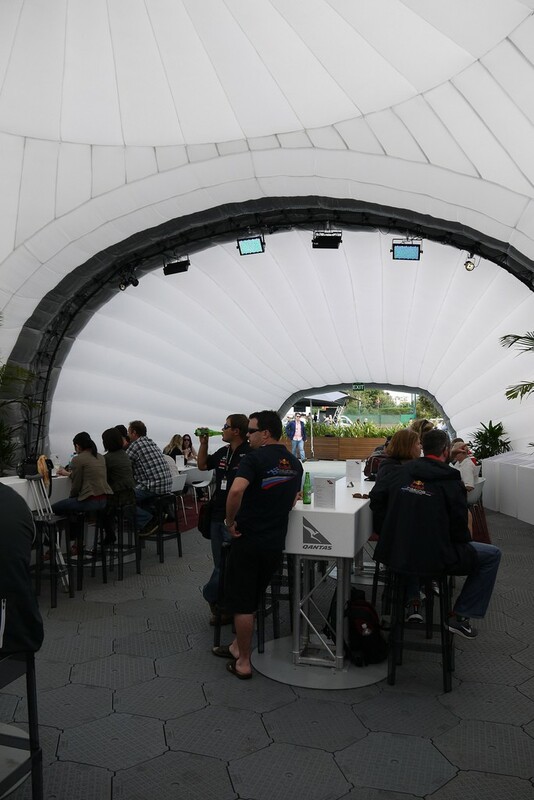 The Hub was effectively a large, swanky blow-up tent with a BBQ outside and café with Barista inside, with a fair bit of seating and large flat-screen TV’s to watch the on-track action. It was only accessible to Silver Frequent Flyer members or above, and the prices for food, drinks and coffee were reasonable given the options on offer and compared to other vendors around the public areas of the event. 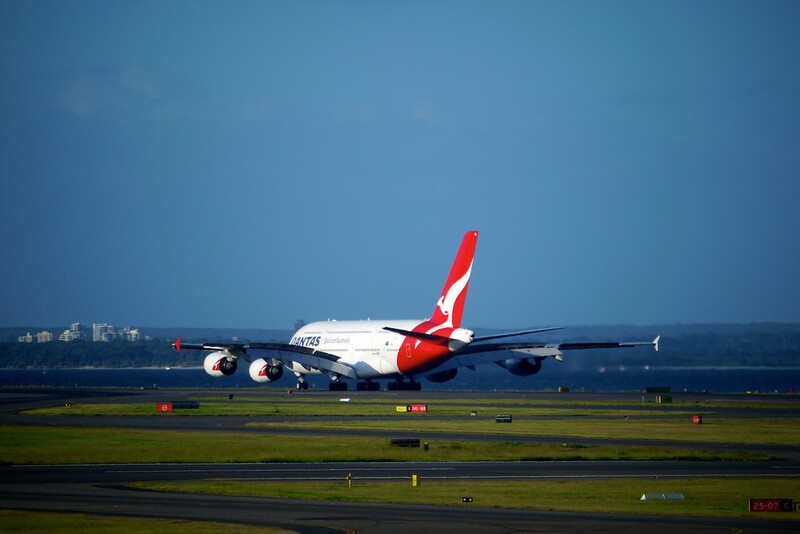 Essentially, it allowed Qantas elite members to grab some food and have a seat in relative peace compared to the rest of the event, especially, if like us, you held ground passes only. 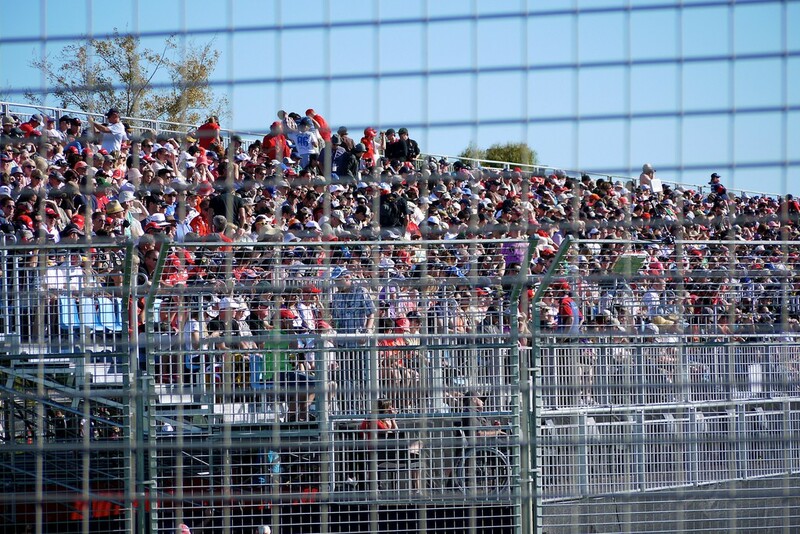 We grabbed a coffee and moved on to explore Albert Park, and ended up settling down in the Ground Access Premium area, overlooking the final turns before the start/finish straight, a couple of hours before the race was due to start. Around an hour before race start, this area and the grandstand opposite really started to fill up. 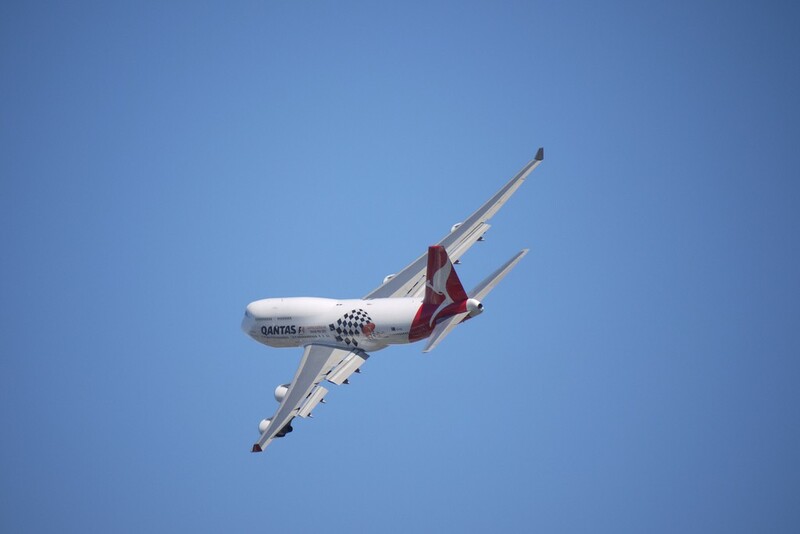 With about 30 minutes to go, the Formula 1 liveried Qantas 747 did a pretty dramatic flypast. The Premium ground area was pretty close to the track, with a group of marshalls handling this set of turns. 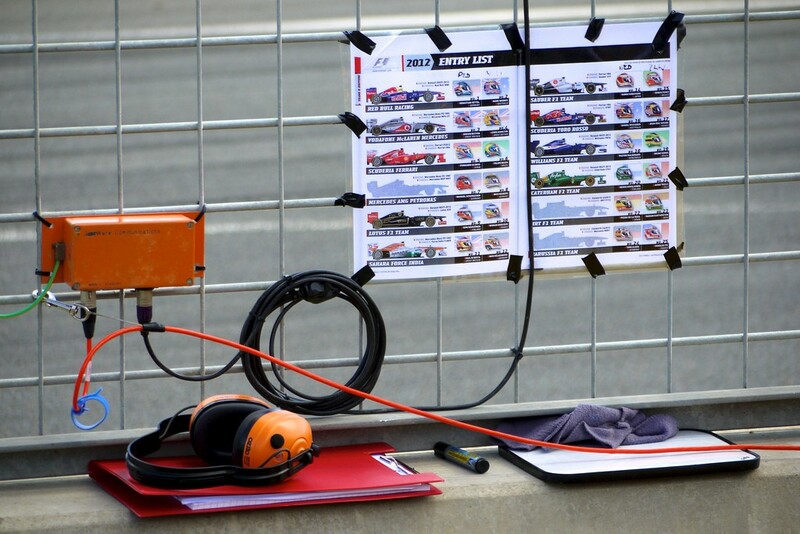 I found it amusing they had this visual entry list pinned up in case they needed to identify anyone. 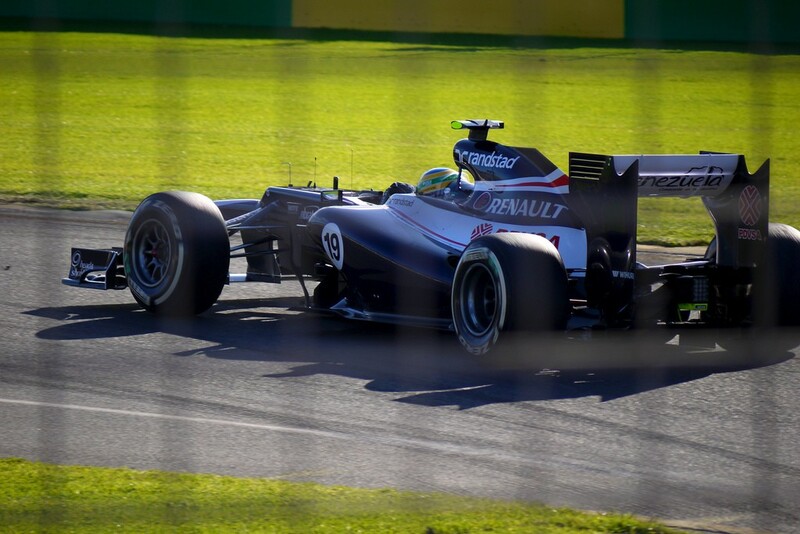 We had a good view, and I really enjoyed the race. It was pretty hot and after a couple of hours of wearing earplugs, I was done, but it was fun. A new experience, obviously very different to watching on TV. After the race, the customary track invasion kicked off, and we walked along the track and final straight with the rest of the crowds. I think I’d be tempted to spend extra for a grandstand seat if I went again, but I’m glad we did ground access tickets only this time. We headed back to the Holiday Inn, dined well on pizza and beer, and crashed before the 8am flight before the next morning. 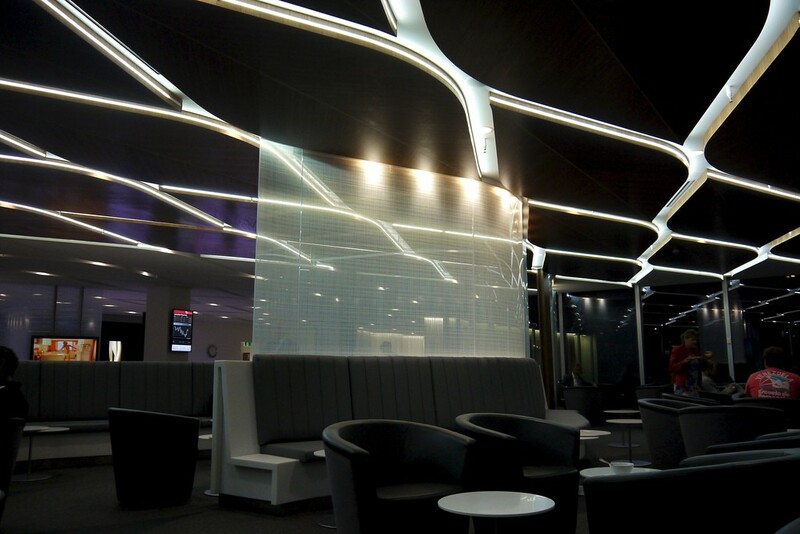 We made it into the Melbourne Virgin Australia Lounge around 7am, and my impressions of this were pretty different to Sydney – a much more interesting aesthetic. 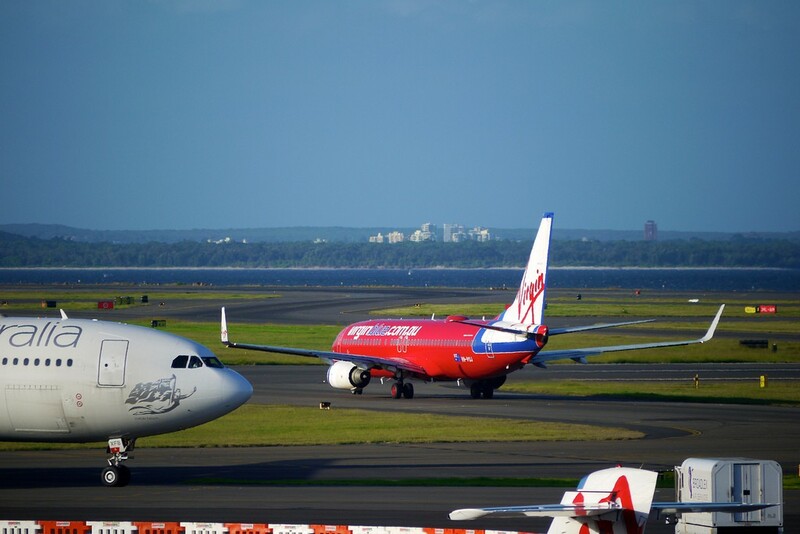 And with good views of the goings on on the Melbourne tarmac. At this point I was approached by the Lounge Manager, and was quizzed, politely but pretty firmly, about why I was taking pictures, as some passengers may object. I muttered something non-committal. I found this intrusive and embarassing. 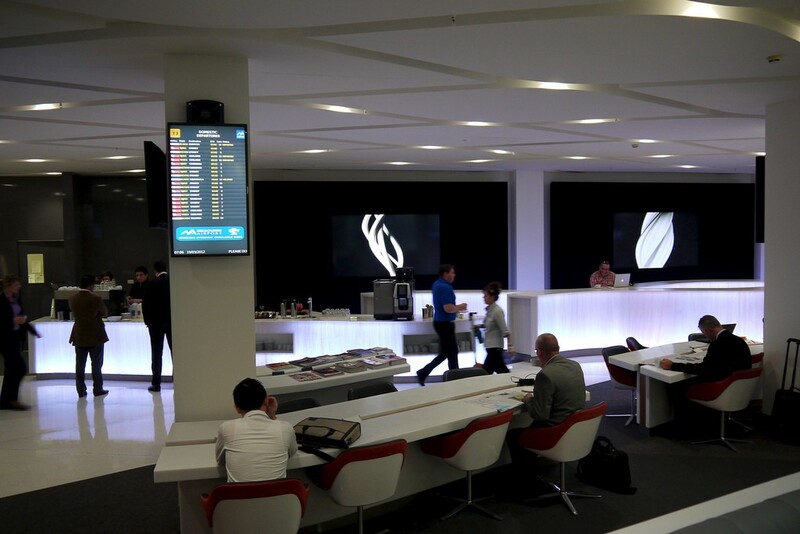 I don’t know if I had the right to take pictures in the lounge – is it a public area? But regardless, it wasn’t a great final impression from Virgin. As you can see, I avoid including others passengers faces in photos I put online, for both privacy and aesthetic reasons (photos without people in just look cleaner!) so I feel comfortable taking photos in lounges. I’d be interested to hear your thoughts… do you find it acceptable? 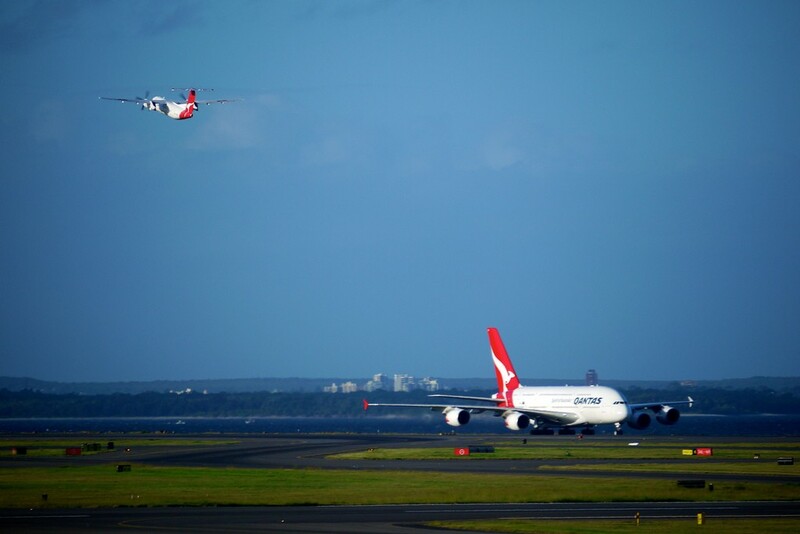 The flight back to SYD was all as expected. The Grand Prix was great. I’ll go again – but probably not next year. 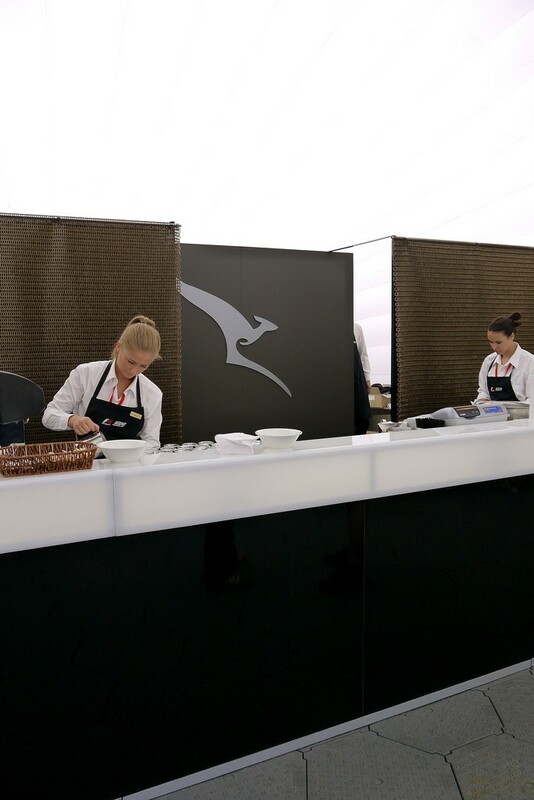 The Qantas Hub was a neat way of rewarding Qantas Frequent Flyers from Qantas. I’m sure they could have given more away, but when you compare it to the other public facilities on the ground, it was a cut above. 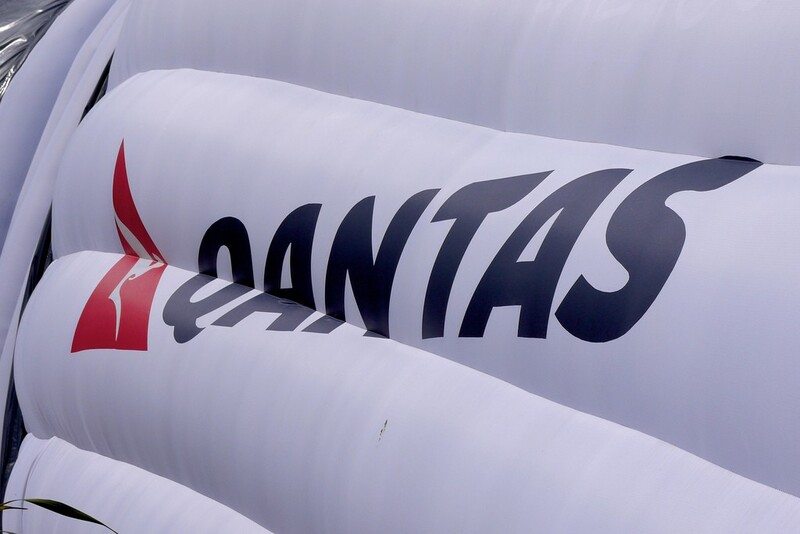 Qantas – more of this please. Holiday Inn Melbourne Airport was a nice enough Airport Hotel. No issues here. 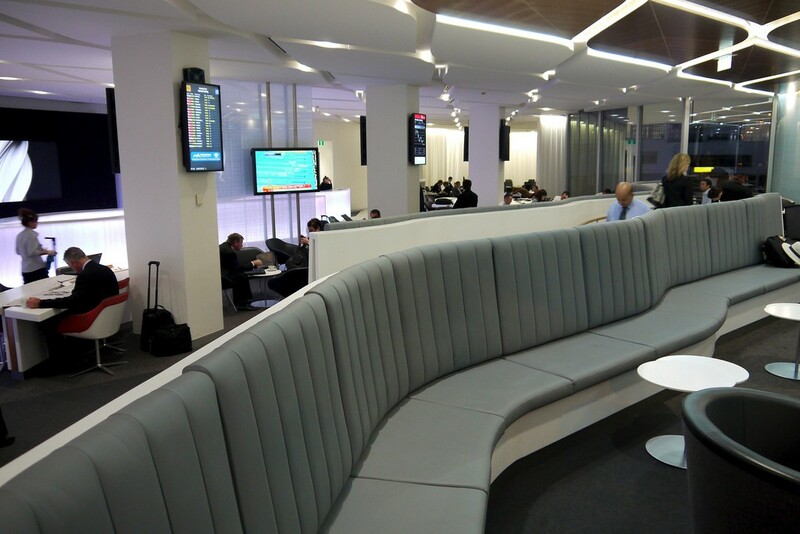 With the exception of the ‘taking photos in the lounge’ incident, Virgin’s service and lounges were on par with Qantas. I’d have liked a complimentary breakfast on the way home (as I would have received with Qantas) but when I saw it was just a Danish, I didn’t feel too hard-done-by. The two-for-one flight on the Virgin Flyer Visa is a great benefit of the card, saving about $250 on this trip alone, and I have another free to use yet this year. 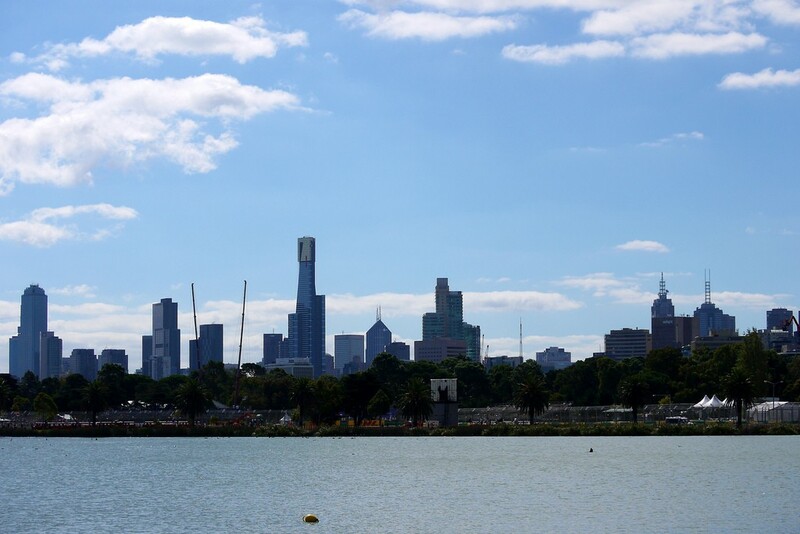 All up, an enjoyable day out in Melbourne!